Add extra style and convenience to your next party with the Sunjoy 60-Quart Wheeled Beverage Cooler. With its refrigeration insulation, this beverage cooler keeps your drinks cold and your guests happy. Though it is made from durable steel, this fun cooler features a faux wooden finish that give sthe piece a charmingly quaint feel. The cooler has a beautiful wood siding design on its sides and has a dual flip top for easy filling and convenient access. 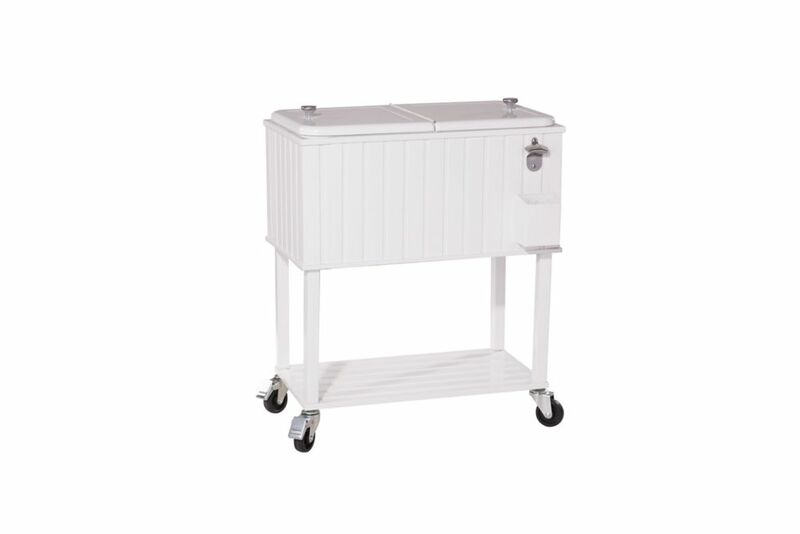 With its clean white finish, this cooler provides a fresh sense of style to any outdoor area. In addition, the cooler features a bottle opener, cap catcher and fetching steel knobs. The white beverage cooler also includes a lower shelf that provides additional storage for extra drinks, glasses or snacks. Transporting this cooler from one place to another is made extra simple, thanks to the wheeled design. For extra security and to ensure the cooler stays in place, two of the castors include their own brakes. The DEWALT DCK277C2 20V MAX Compact Brushless Drill/Driver and Impact Kit is built with powerful brushless motors that deliver more run time over brushed motors. The ergonomic comfort grip handle provides ideal balance and tool control. With extensive storage space of 27 quarts, 5 days ice retention, and IP65 rating for protection against water and dust, this DEWALT. DWST08404 ToughSystem. Cooler keeps beverages ice-cold and refreshing, no matter the external conditions. The cooler can be stacked to any other ToughSystem. module using the side latches, and is compatible with the ToughSystem Trolley, our Van Racking, and Workshop Racking for ultimate stability and security during transit. The Igloo Super Tough cooler is designed to meet the demand for high performance coolers from commercial fishermen, hunters, and work sites. It features bolt-through-body side handles with gasketed heavy-duty back-up plates that won't pull out even under heavy loads and specially anchored, heavy-duty stainless steel hinges for long lasting durability. Maxx Cold X-Series 60" bar Back Cooler with dual direct draw beer tower feature a sanitary stainless steel top and black coated steel exterior for durability and easy cleaning. Forced air cooling distributes air evenly to keep contents of the cabinet cooled at the optimum temperature. Standard 3-inch polished stainless steel draft tower dispensers are attached to the top centre of the stainless steel counter and cooled by continuous cold air circulation through the channel air distributor system. This reduces foam when dispensing beer. Nabor 60 Qt. Cooler Add extra style and convenience to your next party with the Sunjoy 60-Quart Wheeled Beverage Cooler. With its refrigeration insulation, this beverage cooler keeps your drinks cold and your guests happy. Though it is made from durable steel, this fun cooler features a faux wooden finish that give sthe piece a charmingly quaint feel. The cooler has a beautiful wood siding design on its sides and has a dual flip top for easy filling and convenient access. With its clean white finish, this cooler provides a fresh sense of style to any outdoor area. In addition, the cooler features a bottle opener, cap catcher and fetching steel knobs. The white beverage cooler also includes a lower shelf that provides additional storage for extra drinks, glasses or snacks. Transporting this cooler from one place to another is made extra simple, thanks to the wheeled design. For extra security and to ensure the cooler stays in place, two of the castors include their own brakes.